Triple orbs, scheduled to open next year, will house plant 400 species. John Levesque. PICTURED: An Australian tree fern became the first plant to reside in the Amazon Spheres. 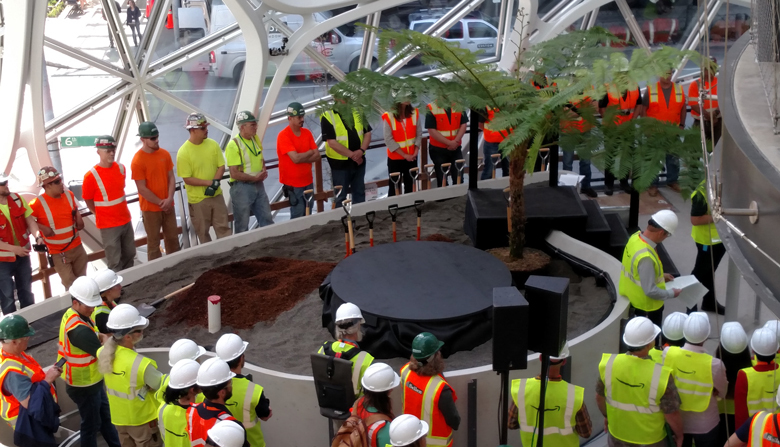 Dignitaries, workers and schoolchildren donned hard hats and safety goggles Thursday to welcome the first plant — an Australian tree fern — to the Amazon Spheres in downtown Seattle. King County Executive Dow Constantine, Seattle City Councilwoman Sally Bagshaw and Amazon VP John Schoettler joined about 150 workers and media people at the pormotional event. Scheduled to open early next year, the Spheres, situated along Lenora Street between Sixth and Seventh avenues at the heart of Amazon's burgeoning downtown campus, will give Amazon employees "a place where they can think and work differently in an environment that more closely resembles a park than an office," according to a news release. The Spheres will house more than 400 plant species at any given time. Constantine, who occupied a law office in a building across the street in the early 1990s, called the Spheres "an oasis in this hive of activity" that is Amazon's $4 billion headquarters complex.